2 “Gem-” monsters If this card is Link Summoned: You can add 1 “Gem-Knight” card from your Deck to your hand. You can pay 1000 LP; Fusion Summon 1 “Gem-Knight” Fusion Monster from your Extra Deck, by shuffling Fusion Materials in your possession listed on it into your Deck, that are banished or in your GY, but it cannot attack directly this turn. You can only use each effect of “Gem-Knight Phantom Quartz” once per turn. Gem-Knight Phantom Quartz does a lot for Gem-Knights. It’s a Link 2 Earth Rock-type Link Monster with 1450 Atk. The requirements for Link Summon are any two Gem- monsters. After it’s successful Link Summon, you can search any Gem- card from the deck. The only real problem Phantom Quartz has is that it can only be used in Gem-Knight decks. Well the Atk isn’t great either, but more so the restrictions. Even the second effect could have been less restrictive. Pay 1000 to Fusion Summon a Gem-Knight with materials that are either banished or in the grave and then shuffling those materials back to the deck. Both effects are once per turn, but the advantage they provide to Gem-Knights is incalculable. 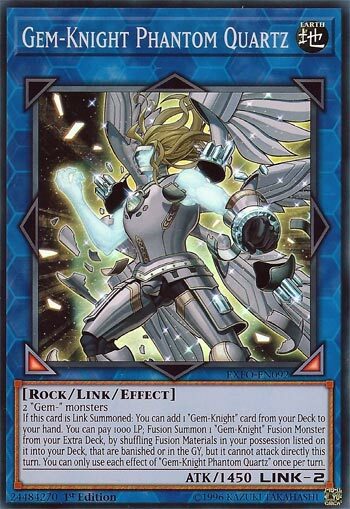 With so many Gem-Knight options, this one Link Monster could provide offense or defense. During the first turn it wouldn’t even matter that the Fusion Summoned monster couldn’t attack directly. Phantom Quartz is a necessity in the Extra Deck, but I don’t think it will push Gem-Knights to the forefront of anything. Still fun though. I really like this card, and I honestly like the Gem-Knight archetype. I am glad they got Gem-Knight Phantom Quartz, a new Link Monster. Phantom Quartz is an Earth Rock Link-2 with 1450 ATK requiring two Gem- monsters and points Bottom Left and Bottom Right. ATK is pretty low, summoning requirements are easy to fulfill in Gem-Knights with cards like Unexpected Dai, Rescue Rabbit, and Brilliant Fusion, arrows are perfect for a Link-2, attribute is good, and type is good for Gem-Knights. If Phantom Quartz is Link Summoned, you can search for any Gem-Knight card. No Brilliant Fusion for this, but Gem-Knight Fusion is important to Gem-Knights as well as cards like Obsidian and Lazuli, so searching those is a major plus. Also, you can pay 1000 LP to Fusion Summon a Gem-Knight using monsters that are banished or in the GY but the Fusion cannot attack directly. Despite the loss of the direct attack, this can still help get a Gem-Knight FTK/OTK off with Lady Lapis Lazuli. Gem-Knights fill up the GY easily with Fusion Summoning and banish a good amount to keep getting Gem-Knight Fusion back. This is an amazing card that Gem-Knights really needed to extend their plays. If you play Gem-Knights and not this, I will be questioning your choices. Both effects are hard once per turns to prevent this from being overly broken. Welcome to my little week of Extreme Force cards! Gem-Knigiht Phantom Quartz is a Super Rare (which I bring up because I think I purposely made the rest of this week non foil cards for fun) and I rather like this card, as I do Gem-Knights as a whole. This is a Link 2 Monster, with only 1450 attack, requiring two Gem Monsters to be Summoned, and has Arrows pointing bottom left and right. So first off, when Link Summoned, you can add a Gem-Knight card from your Deck to your Hand. An automatic +1 off a Summon is always good, and you can take any card of the type, another plus. By paying 1000 Lifepoints, you can Fusion Summon a Gem-Knight Fusion from your Extra Deck. The amazing parts that come with this, is that the Monsters required are shuffled back into your Deck, AND they only have to be in your possession…they can come from your Graveyard or even Monsters that were removed from play all ready. His effects more than make up for his paltry attack. If you’re playing this Deck, you’re playing this card.